I am trying to convert AVCHD footage to a different codec, preferably H.264. When I go to drag the footage in to MacX Free AVCHD Video Converter, the file bounces back and will not load in the application. How can I get the AVCHD footage to load in to the application? Are there restrictions on the format? Thanks so much! It's unsurprising that shutterbugs have a lot of AVCHD footages saved in their computers while it's surprising if they can import the AVCHD recordings on all the devices or editing software they have since many AVCHD video files, whether you shot by Canon, Sony or Panasonic, are incompatible with iPhone, iPad, Samsung, HTC, iMovie, iTunes, YouTube, etc. As a result, to convert AVCHD to H264 or other friendly format is deemed as indispensible for unlimited playback, editing or sharing. Fortunately, the wide availability of AVCHD video converter software makes your video conversion from AVCHD to H264, MP4, MOV, AVI, WMV, etc as easy as possible, even without having to pay anything. So you get a free AVCHD video converter ready in hand and load your AVCHD footage, wishing to freely convert it to make it more compatible. But things will not go smooth even in the early AVCHD loading stage like the scenario mentioned above. 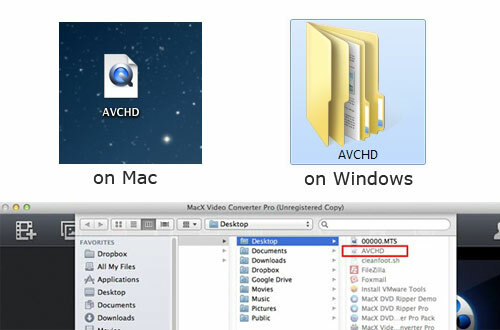 Well, take it easy, the following tutorial will explain the detailed reason for the AVCHD loading error and lead you to a successful AVCHD video conversion on Mac OS using the cutting-edge MacX Video Converter Pro. 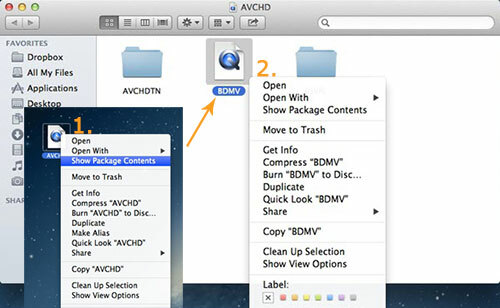 As a result, if you directly drag AVCHD file in Mac OS, it will bounce back and not load in the program, even if you load the AVCHD file by click "Add File" button on the top left of the windows. So to load AVCHD file and convert AVCHD MTS to H264, MP4, MOV, AVI, FLV, WMV, etc successfully, you'll have to do as follows to add the MTS file and finish the AVCHD video conversion. Right Click the AVCHD and select Show Package Contents. 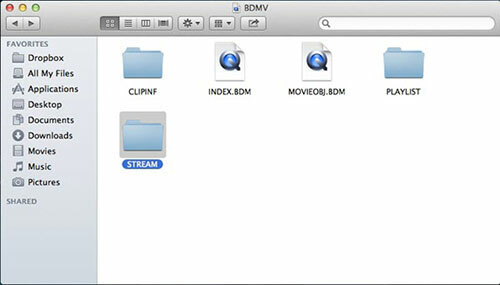 Then Right Click BDMV and Select Show Package Contents. Go to Folder STREAM and drag the inside MTS file to our program for converting. 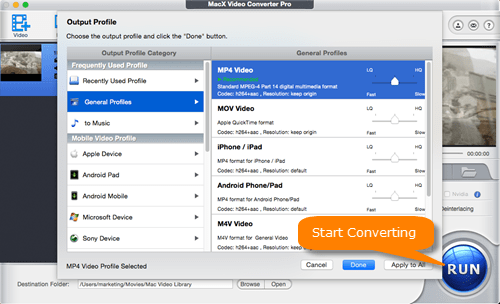 Then you can load AVCHD MTS video to your Mac with the AVCHD MTS video converter. Choose the output format from the pop-up window. You can convert AVCHD to H.264, AVCHD to MP4, AVCHD to MOV, AVCHD to WMV, AVCHD to AVI, and even transfer AVCHD to iPhone 7/6S/Plus, iPhone 6/Plus, iPad Air 2, iPad Pro/mini 4, Samsung Galaxy S8, and more with the best output quality. Click the "RUN" button at the lower right corner of the interface to begin converting AVCHD to H264 format on Mac OS X. 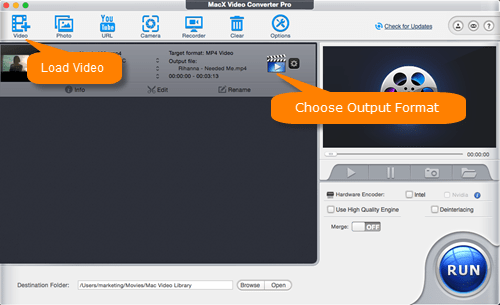 Besides enabling you to convert AVCHD to H264 on your Mac OS X, MacX Video Converter Pro also features excellent HD video converting performance even on Mavericks. It supports almost all HD videos as input and helps to convert them to a video with smaller size, like AVI to MP4, VOB to MP4, MKV to MP4, MTS to MOV, etc with 36X faster speed. It also performs as a well-know screen recorder, able to record screen video and convert recordings to any format or device with ease. Free download the best AVCHD video converter - MacX Video Converter Pro to easily and fast convert AVCHD MTS M2TS to H.264 MP4 with high quality reserved for limitelessly playbacvk on iPhone 7/7 Plus, iPhone 6S/SE/6 Plus, iPad Pro/Mini 4, Galaxy S8 etc.